Tonight is clear and cold. When I look at the constellations, I worry about Orion’s arm. Surely, it’s throbbing after all this time holding up that bow. After many minutes of surveying the night sky, my neck feels strained so I lower my gaze back to the albatross chick in front of me. Lately, rain showers have been few and the dry air catches in my throat causing me to cough uncomfortably. I worry for the one-millionth time that giraffes also suffer from sore throats and imagine what’s unpleasant for me must be quadruple-ly unpleasant for them. Part of me knows these worries are superfluous but part of me also thinks I make a good point. Mostly, I’d rather worry about the nonsensical because what’s real is way too real. The winds are howling, I’m cold under three layers of clothes and the albatross chick in front of me whose parents have been gone for twenty-four hours is shivering in his nest. His parents are keeping him well fed but they are less vigilant about sitting on him than other parents of similarly sized chicks. He is not the only chick alone in its nest tonight, but he lives close enough that I can check on him from my bedroom window. I have committed a faux-pas in the science world and named him. This chick is now the size of a large coffee cup and I call him Home Alone. I watch Home Alone constantly. I lose sleep when the nights turn cold and his parents are far away and on the rare evenings that rain taps gradually on my window, I throw on my raincoat to check on him. I would like to bundle him up in my hat and move him to my room but I know nothing about being an albatross mother. My worries about Home Alone the albatross chick are not unfounded which means it’s easier to fall asleep when I’m thinking about Orion’s sore arms. Seabird nesting colonies are excellent examples of mortality and living on one is to daily bear witness to pre-death and death itself. Science training has taught me not to interfere with the natural design of things and so I distract myself with theories of ‘survivorship’ or the average proportion of offspring that survive to a particular age. In general, there are three survivorship curves that represent the life patterns of various species. Humans fall into the type 1 category. Typically, humans have a high survivorship rate until they reach our species ‘maximum lifespan’ or old age. In part due to their high success rate, humans typically only have a few offspring. Songbirds represent type 2 as they have a relatively constant mortality rate throughout their lives. The type 3 survivorship curve represents species, like seabirds, that have low survivorship rates at the beginning of their lives but once an individual reaches a certain age they are likely to live well into old age. Species that fall under the type 3 curve typically have many offspring throughout their lifetime. For example, once they reach maturity albatross pairs will lay an egg 2-3 times out of every 3-4 years for the rest of their lives. They occasionally skip years to molt their feathers as such an event expends enough energy that it can not be done while raising a chick. Before coming to Kure, I had spent enough time on seabird nesting colonies to know I would see some seabird chicks and adults die. However, watching chicks and occasionally sickly adults day after day on the brink of death is harder than I imagined. Constantly reminding myself that I can not help the birds any more than ensuring the safety and integrity of their environment (i.e. the work we’re already doing) doesn’t really help. If you ask me, the type 3 survivorship curve is heartbreaking. Even before chicks were hatching, eggs were failing as some were not fertilized and others were abandoned by the adults. Once hatched, young chicks can suffer from inexperienced parents, starvation, exposure to the elements and avian pox. Starvation is typical if food stocks (think fish populations) are low or cannot be located by the parents or if one parent dies. Severe weather can be equally deadly as high winds create sandstorms that can bury chicks in their nests on the beach or high tides can sweep away chicks and nests. Chicks do not have their weatherproofed feathers yet and heavy rains can make them freeze while hot sunny days can give them heat stress. Already, a few hot afternoons have had chicks in their heat-relief position where they move so their backs are facing the sun allowing their large webbed feet to extend in front of them and help them cool off. It’s really cute when they sit this way. Then again, everything the chicks do is pretty adorable. Half of my day is actually quite uplifting as I pass by chicks with full-bellies contentedly napping under, next to and occasionally intertwined in their parent’s legs. Unfortunately, I feel like I pass by just as many nests sporting a dead chick. This morning, walking back to camp, I stop when an adult Laysan albatross lands next to a nest with a chick that has been dead for days. The chick’s body is completely deflated and is sitting outside the lip of the nest like a soft, small grey rug. There is a hole in its skin that is rippling with the movement of flies. I think adult albatross could benefit from cell phones and this one’s mate should have texted to say ‘don’t bother coming back this year.’ Instead, I watch the just-landed albatross make the ‘eh eh eh’ noise that seems to have multiple meanings but that I’ve gleaned to imply ‘this is my spot/nest/chick/mate.’ As the albatross slowly walks into the middle of the empty nest, I wonder if the constellation Orion rests his arms when the sun is up. When the albatross sits down and shakes her head free from flies, I wonder if we should start passing out cough drops to giraffes. Next, the adult albatross stands. Sometimes the reality of nature is too real or perhaps I’m simply too faint-hearted to live on a seabird nesting colony. 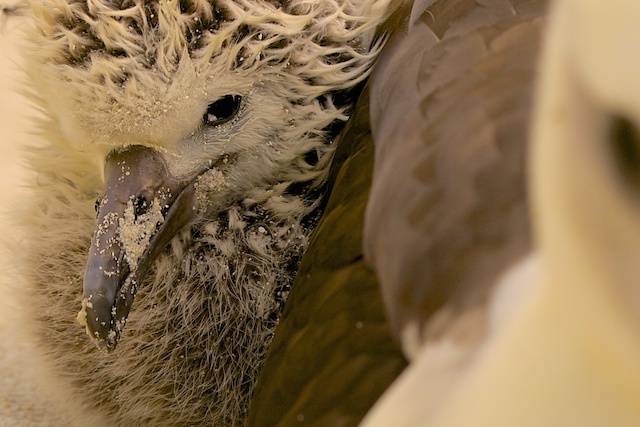 The newly-returned albatross looks me directly in the eye. Then she looks at the remains of her nearby chick, lowers her head and gently nudges the lifeless body with her beak. Harrison, Craig S 1990 Seabirds of Hawaii: Natural History and Conservation. Cornell University Press. Ithaca, New York.